Minority Report was a 2002 American science fiction film based in 2054 where police officers apprehended criminals based on predictions and foreknowledge. We are not in 2054 but fast-forward to 2017, we are now closer than ever before to the world imagined in Minority Report because of Machine Learning (ML). ML is a type of Artificial Intelligence (AI) that provides computers with the ability to learn without being explicitly programmed. For all intents and purposes, ML is foreknowledge that can be applied across several disciplines in order to answer questions and make predictions. One such discipline, predictive policing, uses ML to predict the likelihood of crime. 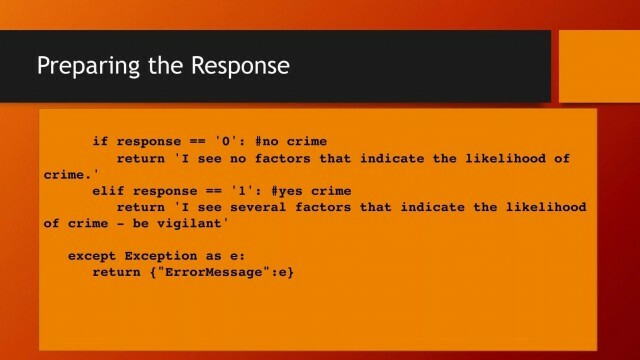 This talk introduces ML through a predictive policing program called SAM (Suspicious Activity Monitor). During this talk, the “secrets” and technologies behind SAM are uncovered and attendees walk away with the necessary tools and understanding to incorporate ML into their own applications.